Hey, that is an awesome work of art! I like the way it is running and it looks super nice since you colored it. I like the colors and the shape of the body is great, the legs aren't chubby like mine always turn out, so... you're an artist! Great job, awesome! You are great at drawing! These are wonderful drawings, way better than I could ever do that's for sure. It looks just like my horse and I wish I had it. That would be amazing! I could put it in her tack room! Great drawings, better than I could do. beautiful! I love it. plz plz keep going! That is the best drawing I have ever seen in my life! Make more, please!!!! hi i am a very huge fan of horses. That's amazing! I wish I could draw that good. I will post a pic on facebook so everybody can see how good or bad I am. omg! you are sooooo good at drawing, that's amazing!!!!!!!!!!!!!!!!!!!!!!!!!!!!!!!!!!!!!!!!!!!!!!!!!!!!!!!!!!!!!!!!!!!!!!!!!!!!!!!!!!!!!!!!!!!!!!!!! Wow love the paint especially! Great picture! who did so good I love it. I am new. I HAVE like 18 Horse books all about Winnie. I love these drawings, i have a lot of my own but how do i load on 2 here? I have improved GREATLY since these. Awesome picture! 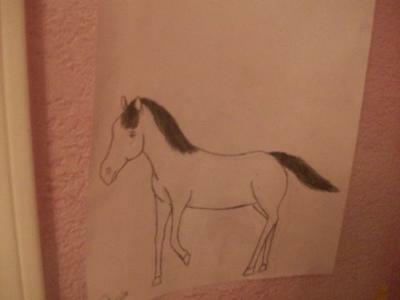 I love to draw horses especially paint horses like yours. Good job! Wow you're good. Is that a stencil or something? This horse is my dream horse!!!!!!!!! 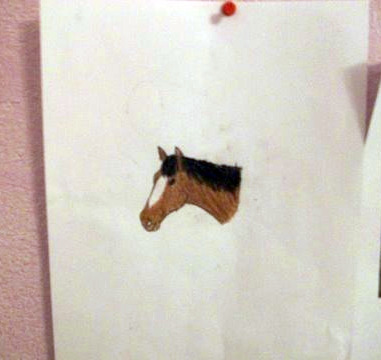 I love your horse drawing. Compared to my drawings, you are a pro. Sometime can you make y=Youtube videos teaching us how to make a woderful drawing please! Did you get this idea from a book? Because I have a book on drawing horses with the SAME drawing in it! i love the horse drawing, i love it. i love the horses you did is good and the horses are so cute. But the third one's head is a little big. Otherwise really cool! Very good! They should make a breyer horses of that horse. To bad they don't make custom models. i draw horses like u, we are good horse drawers. Your art is awesome!I could never do that! OMG!!!! You're art is AMAZING!!!!!!!!! You should totally go to art school, that is really amazing!!!! Keep up the good work!! That's awesome!!! I love paint horse!! That so cool ! ur excellent ilovehoseesss! Your drawings are A-maze-ing!!!!!! I have a book that teaches you how to draw and that was one of the choices to draw. I drew on like that, but I lost it, and it wasn't nearly as good as yours. Please reply and tell me if you have a book that has the paint in it. And did you go to an art school or something? 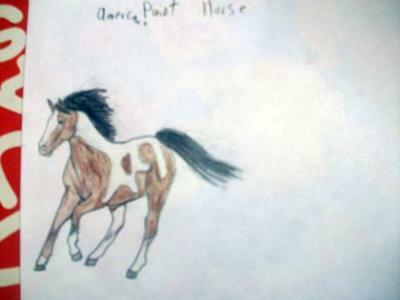 I love your drawings & picture of horses in your horse story about Nyn Acres. great! when I saw them I actually SMELLED horses for like three seconds!